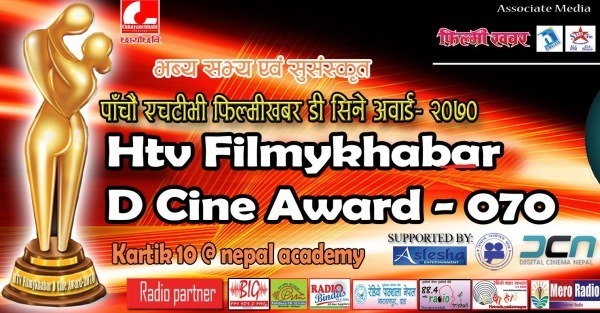 Nepali actress Rekha Thapa has won the best actress award in HTV Filmykhabar D Cine Award. Rekha was awarded the award for her role in her movie ‘Lanka’. The best actor award was awarded to Jiwan Luitel for his role in ‘Notebook’. In the best movie category, ‘Rhythm’ was awarded the best in the year. In this year’s award, ‘Maya’s Bar’, ‘Rhythm’ and ‘Notebook’ bagged most of the awards. This entry was posted in Artists, Event, Movie News and tagged Arpan Thapa, Award, Bikash Acharya, Gajit Bista, Gaurav Pahadi, Jharana Thapa, Jiwan Luitel, Karishma Manandhar, Maya's Bar, Mero Jiwan Sathi, nisha adhikari, Notebook, Purosottam Pradhan, Rekha Thapa, Rhythm, Sharmila Malla, Tika Pahadi, Wilson Bikram Rai. Bookmark the permalink.